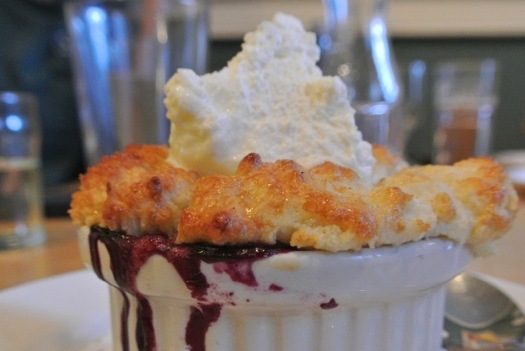 A culinary journey of local flavors started well before my cobbler dessert at the Palmer House. I started the meal with an all-New York State brewed beer from Rare Form Brewing in Troy (meaning the ingredients for the beer all came from within the state) ($6). The beer was lightly amber in color with smooth malt notes throughout -- the perfect beer for a breezy summer afternoon. 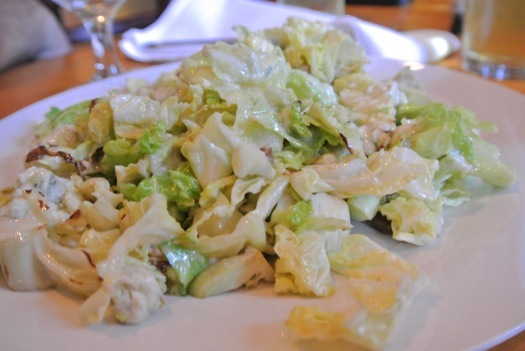 A frequent guest of The Palmer House had recommended the Savoy Cabbage Salad ($9.50) for my dinner (while listed on the appetizer list, it easily serves duty as an entrÃ©e). Rough-chopped local Savoy cabbage is briefly sautÃ©ed and lightly dressed with tangy vinegar and Dijon mustard -- the gentle heat and acidic nature of vinegar work together to break down the cells of the cabbage while keeping it from becoming a limp mess of laurel green. House-cured pancetta from Kuhar Farms, the family farm of Palmer House chef Micah Kuhar, is diced and cooked until crisp to garnish the salad, and big globs of creamy gorgonzola cheese are scattered throughout. The salad is reminiscent of a classic wedge, but with the seasonal use of local ingredients to put a Palmer House spin on the dish. And now onto the cobbler ($6.50): I come from the camp of opting for a not-too-sweet dessert. While I'm more likely to choose a piece of chocolate cake to cap a meal than a cheese plate, I don't want that cake to be so saccharin that the rich notes of chocolate are masked. The focus here was definitely on the fruit: Big, fat, juicy local blueberries and just-ripe peaches nestle together in a purple pool of fruity juices that are only slightly sweetened, letting the fruit truly shine. A thick layer of dense dough tops off the fruit -- again, not too sweet. The same is true for the dollop of whipped local cream. I couldn't even definitively say that the cream was sweetened; with the ubiquity of good grass this season and the natural sweetness of good local cream, I think any hints of sugar come from the cow herself. 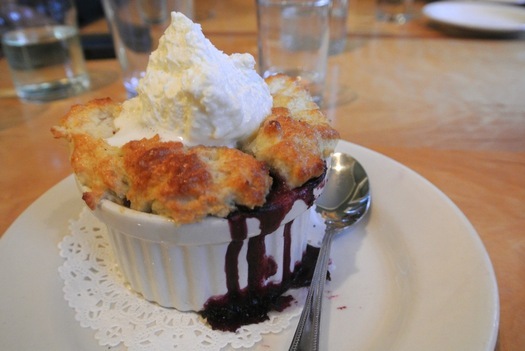 My dining companion said the cobbler reminded him of a "melted muffin," but in a good way. I can't think of a better way to describe this dessert. 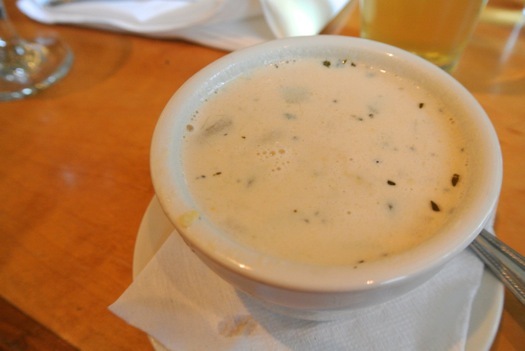 I have heard that there is a bit of a secret menu at The Palmer House CafÃ© among locals and frequent guests. Ask for a "salty, filthy" burger, which will come to you topped with an eye-popping heap of whatever cheese the chef has handy that day and chopped olives. In colder weather, the chicken and biscuits are not to be missed. Whatever you choose, the chances are good that your meal is locally sourced or grown/raised by the chef himself. Even with a busy weekend rush, the food was perfectly executed and served merely as a vessel to highlight the great agricultural products around us -- whether that be beer or peach blueberry cobbler. You have just given me a great reason to find out where the heck Rensselaerville is! Palmer House is a GREAT place - definitely worth the drive. The food is always awesome! It looks great. Is there anything else to do in Rensselaerville or nearby to make a day trip out of it? Google didn't show much. @Burnt and Amy: The Huyck Preserve is literally just up the road (you might even be able to see the Palmer House from the parking lot) and it's well worth a visit, if only to check out the waterfalls. Thanks Greg! Now I'll just have to decide whether to bring the dog to the Huyck preserve or go to the Palmer House for dinner. Had that very cobbler, it is amaaaaazingggg. Request for more photos of the cobbler! I want to see the insides!